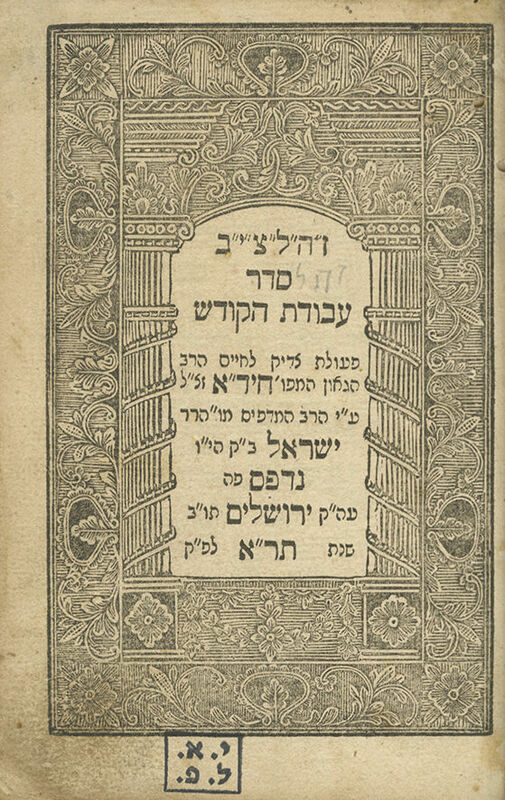 Avodat HaKodesh, laws, practices, segulot and Tikkunim, by R. Chaim Yosef David Azulai – the Chida. Jerusalem: R. Yisrael Bak, 1841. Two title pages, the first one with a woodcut border. The first book printed in Jerusalem. The book begins with a foreword by the printer (leaves [2b]-). This foreword is a renowned and notable source documenting the history of Eretz Israel, of the Galilee and of Damascene Jewry. R. Yisrael Bak relates of his travels before reaching Jerusalem: His immigration to Eretz Israel and establishment of the printing press in the Galilee; the earthquake of 1837 which claimed the lives of thousands of Jews; the riots in Galilean towns in 1834-1838 by rebels who renewed their attacks on the earthquake survivors, plundering and destroying their remaining possessions. R. Yisrael relates of his involvement in the 1840 Damascus affair, reporting that he urged Moses Montefiore to get involved, by sending him letters to London from Alexandria, where he was residing at that time. He acclaims the Sephardi Torah scholars and investors who assisted him in reestablishing his printing press in Jerusalem. , 111 leaves. 15 cm. Good-fair condition. Stains and wear. Marginal creases to several leaves. Minor damage and tears. Marginal dampstains to last leaves. Worming to margins of first title page and last leaves. Handwritten inscriptions. Owners' signatures in Oriental script on second title page ("Yaakov Tzribis"; "Yaakov Tribis"). Stamp on title page. New leather binding. The first Hebrew book printed in Jerusalem. Sh. HaLevi, no. 1.